Get rebates up to $500 when you add attic or roof insulation. New Mexico Gas Company offers a rebate for 25% of the cost, up to $500, when you have a licensed and insured participating contractor add insulation to your home’s attic or roof. Insulation added between April 1, 2019 and March 31, 2020 is available for rebates with our 2019 program. Rebate application and additional information is provided below. Why upgrade your home’s insulation? Energy and money savings. 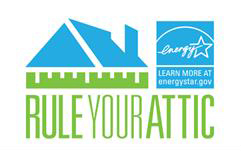 ENERGY STAR® estimates that you can save up to 20% on your heating costs by insulating your home. Improved comfort. Insulation helps retain the heat in your home during the winter and keeps your home cooler in the summer months. The attic is the easiest place to add insulation to improve the comfort and energy efficiency of your home. More is better. Insulation levels are specified by the R-value, a measure of the insulation’s ability to resist heat passing through it. The higher the R-value, the better the insulating performance. Rebates available. Tiered rebate amounts are available depending on the R-value of your existing insulation. (Higher R-values indicate better insulating properties.) Only customers who receive natural gas service from New Mexico Gas Company, as evidenced by the New Mexico Gas Company residential customer account number, are eligible. If your roof is flat, there are a few additional things you'll need to know. To be eligible for this program, your attic currently must have 6 inches or less insulation. The ideal time to add insulation is when roof work is being done. Here are three typical ways to add insulation to your roof or attic. Blown in from the Roof Deck Insulation can be blown into the roof cavity from the top of the roof deck. Your participating contractor will create access holes by removing sections of the roof decking and then blow insulation into the roof cavity. The contractor then will seal the roof deck and complete the roof work. Rigid or Spray Foam from the Roof Deck Your participating contractor can add rigid or spray foam insulation to the roof deck. The roof cavity or attic space must be converted into an unvented, conditioned space. To convert the roof cavity into an unvented and conditioned space, your contractor will seal the exterior parapet vents. Your contractor must include a description of this work on the invoice. Installed from the Inside Another option is to have the insulation installed from the inside of your home. Contact a participating contractor to evaluate your home’s insulation. Have your contractor determine your insulation needs and then install the new insulation. Submit your completed Rebate Application, along with a copy of your invoice and “before” picture, for processing. Get your rebate check in four to six weeks. All licensed and insured contractors are encouraged to register as a NMGC participating contractor. Download rack cards, door hangers, yard signs and other materials to help you market your participation in this program. Learn more about sealing air leaks and insulating homes on the ENERGY STAR website.